Today the port of call wsa Monaco/Monte Carlo. I was here back in '09 on the Carnival Dream-so this was the one port I visited before. From what I remember, there wasn't a lot to see in Monaco-and since we we're here until 10:00 pm est, I could see the city later, so I did what I did last time-took the train to Nice. I walked up the hill, and followed the signs to the station. But first, I found a Starbucks-but I didn't go inside-I checked my email with the wifi. (I haven't checked my email since Barcelona). I then found the station which was built into the rocks, and bought a ticket. I found the train was 15 minute late (or so), so I waited, and met a few of my friends from the yacht. The train ride took about 20 minutes. Once there, I got off with the crowd, and spied a rack of brochures, and saw one for a hop-on hop-off bus. I went to the tourism office across the street from the train station, to look for the hop-on hop-off bus, which I thought might be a good way to see the city. I was told that I could pick up the bus by the waterfront-so I followed the directions down a wide tree-lined boulevard to find the hop-on hop-off bus. Along the way,I stopped at a shopping mall to use the bathroom. After the bathroom, I continued to walk towards the shore. I found where to go to catch the bus, and that I had another 45 minutes to catch the hop-on hop-off bus, so I wandered along the beachfront promenade. It wasn't very crowded, but it was nice. It was sunny and warm, in the 60's. The beach was stone-filled. After wandering up and down the promenade, I went to the stand for the hop-on hop-off bus, and got on. I went to a place on the upper deck, and sat as the bus drove along the promenade, up a hill, past beautiful European stone buildings, and listened to the recorded voice. It went to the top of the hill, and back down along a curvy road, past the Chagall and Matisse Museaums; I was going to get off the bus, bus as I walked to the exit, the bus started to move again; I was too late. The bus went down the hill, and I passed a part of town that had quaint stores and restaurants. I stopped, and ordered two paninis (Which we're microwaved). Then I walked up past a church where classical music was playing, and went inside. Practice was going on, and I was the only one watching. Then I walked through a pretty Jewish cemetary with large monuments, and further up again, following a footpath to an observation point, where I could see the beach, and watch planes landing at the Nice airport. After a few minutes-I walked back down the hill towards the waterfront. 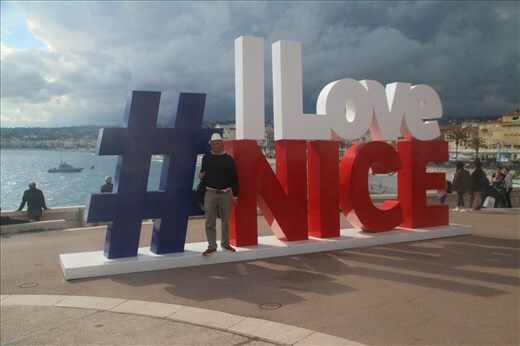 I took a picture by the I love Nice sign, and lied along the beach along the stones to see if they we're comfortable (they were'nt bad). I also stopped for a dinner of mussels and fries at a sidewalk cafe. I then took the train back to Monaco/Monte Carlo. I still had a few hours before the ship left-so I walked past the casino, passed the very expensive apartment buildings, and at around 9:00 pm-back to the ship. I stood on deck and watched the ship pass by the mega yachts.